What’s your Phoenix light rail station personality? 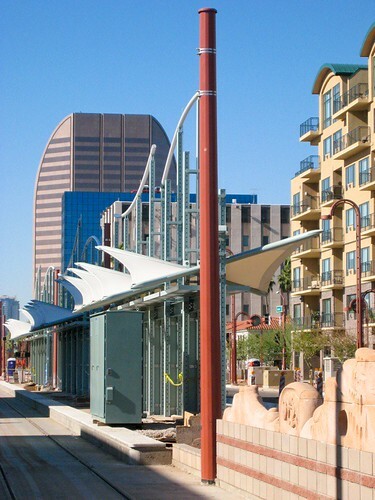 [Source: Ron Sanzone, Arizona Republic] — Each of Metro light rail’s 28 starter line stations has a unique design, with special efforts taken to reflect the neighborhoods where stations are located. Mike James, who spent seven years working for Metro as a station planner and architect, spoke the Arizona Republic about the stations, which will be in full operation December 27 when light rail begins running between north-central Phoenix and Mesa. Click here to read the full interview. [Source: Tim Vetscherm, ABC 15 News] — Three new speed cameras have been added to the I-10 corridor through downtown Phoenix. The cameras are part of 100 systems that will be added to Valley freeways and highways in the coming months. Sixty cameras will be of stationary variety and 40 will be mobile speed units, according to Department of Public Safety officials. The newest additions are along both eastbound and westbound I-10 at 15th Avenue and eastbound I-10 at 16th Street. A Department of Public Safety spokesperson said the camera locations in the Phoenix Metro area will be based upon serious injury and fatal collision data. “Our goal is to slow speeds down in those areas we can show have a high area of collisions that are speed related,” said Lt. James Warriner with DPS. The Arizona State Legislature delegated close to $20 million to the vendor for implementation of the program, $4 million to the State Supreme Court Administrative Office of the Courts, and $2.173 million to DPS to administer the program. For a list of locations of the Valley’s new speed cameras, click here.